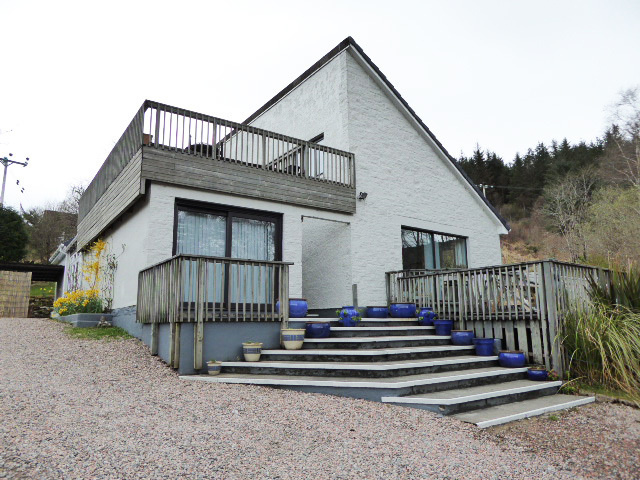 An impressive, detached villa in immaculate decorative order throughout this lovely property has been designed to take full advantage of both light and views and sits in approximately ¼ acre surrounded by an abundance of wildlife, woodland and mountain scenery. 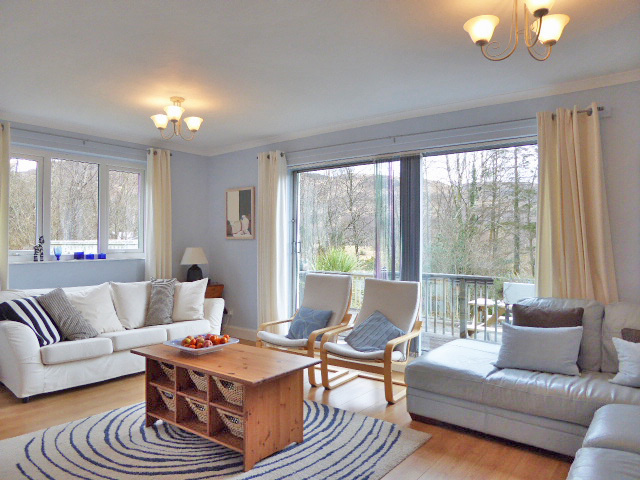 With neutral decor throughout this beautiful property forms a clean and contemporary family home which benefits from substantial living accommodation, double glazing, oil heating and solar panels which benefit a return from the grid. 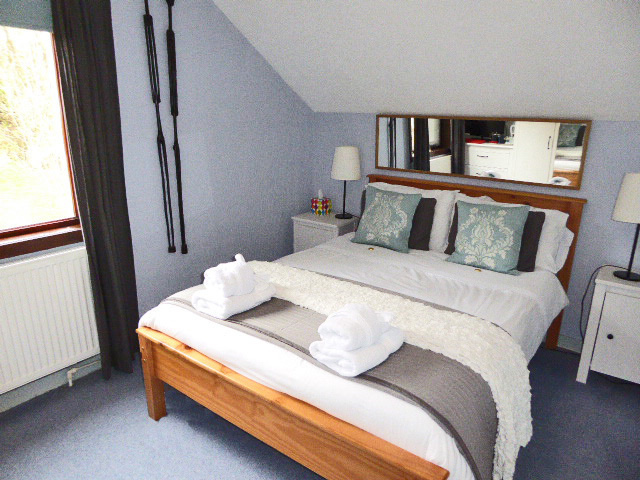 Accommodation comprises: Ground floor, Reception hallway, lounge, fitted kitchen, utility, dining conservatory, three ground floor bedrooms (two en-suite), W.C and shower room, 1st floor: 3 bedrooms, (two en-suite) and shower room. Access to sun decking balcony. 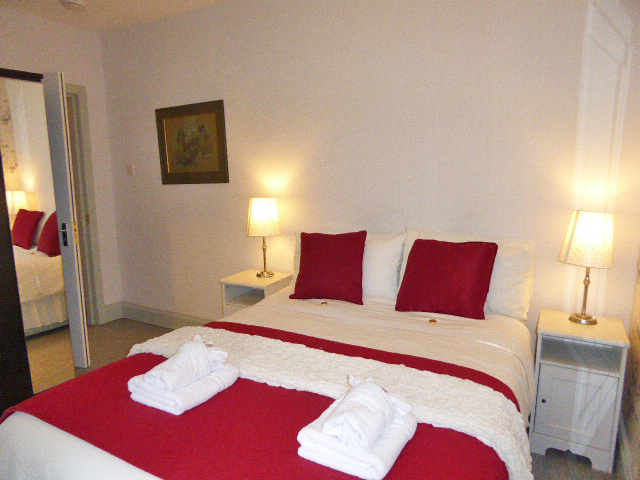 The layout and size of the property lends itself well to bed and breakfast. Indeed, the current owners have successfully undertaken Bed & Breakfast in the past. Anyone wishing to purchase with this in mind can, under separate negotiation purchase the majority of the house content. 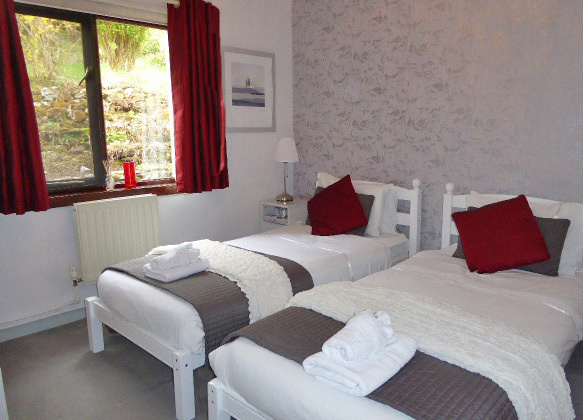 The property is situated in the hamlet of Inchree which is on the outskirts of the village of Onich, approximately 10 miles south of Fort William and 5 miles North of Glencoe, and ideally situated to take full advantage of the tourism from nearby Fort William, Glencoe and North Ballachulish and the leisure activities the area has to offer. 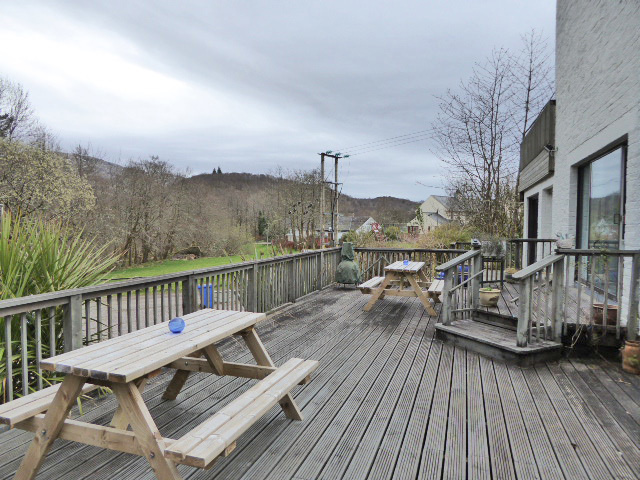 The village of Onich has a local shop, cafe, hotel, pub and restaurants. A local primary school is nearby with the secondary schools in Fort William, Strontian and Kinlochleven. Fort William is the main district town of Lochaber and is known as the "Outdoor Capital of the UK." The town is a popular tourist destination and has a wide variety of tourist attractions including the Caledonian Canal, Ben Nevis, Glen Nevis and the Great Glen and has developed an enviable reputation for providing all manner of outdoor pursuits including skiing, hill walking, mountain biking and sailing to name but a few. 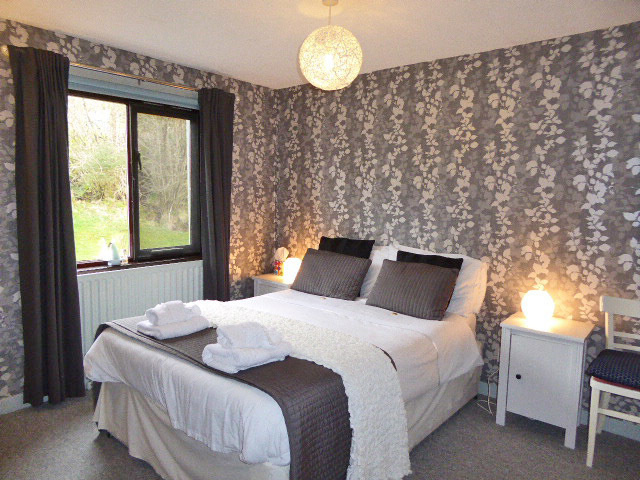 With that reputation, there is an increasing demand for holiday accommodation and this demand could be met by Glendevin offering bed and breakfast accommodation. DIRECTIONS: Glendevin, Righ Crescent, Onich, Highland, PH33 6SG From Fort William proceed southwards approximately 10 miles on the A82, travelling past the Corran Ferry until reaching signs for Inchree. Turn left into Inchree and follow the road until reaching Glendevin on your left. RECEPTION HALL Spacious reception with understairs storage cupboard. STORAGE ROOM, GROUND FLOOR 7.26m x 2.07m (23' x 8'10") This huge room is currently set up for storage but has great development potential and would make for a fabulous games room or 2nd sitting room. Sliding doors lead out onto sun decking. LOUNGE/SITTING ROOM 5.82m x 4.08m (19'01" x 13'04") This bright and spacious sun trap room allows the light to flood in and really connects the house to the garden. There are large sliding patio doors leading out onto sun decking and seating areas. Besides the fabulous views a feature of the room is the electric, inset fire. Modern wall radiator and Laminate flooring, KITCHEN 5.21m x 2.64m (17'01" x 8'08") Spacious and modern with a variety of wall, drawer and base units with gloss white finish and contrasting dark worktops and walls. 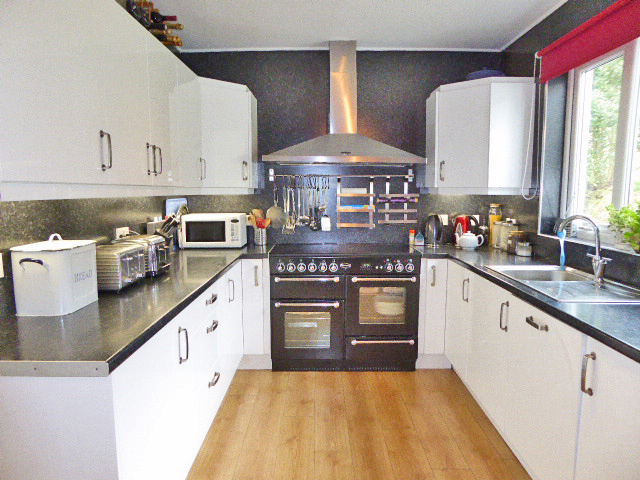 There is space for a Rangemaster double oven, grill and hob with extractor chimney. Integrated fridge and dish-washer. Laminate flooring. 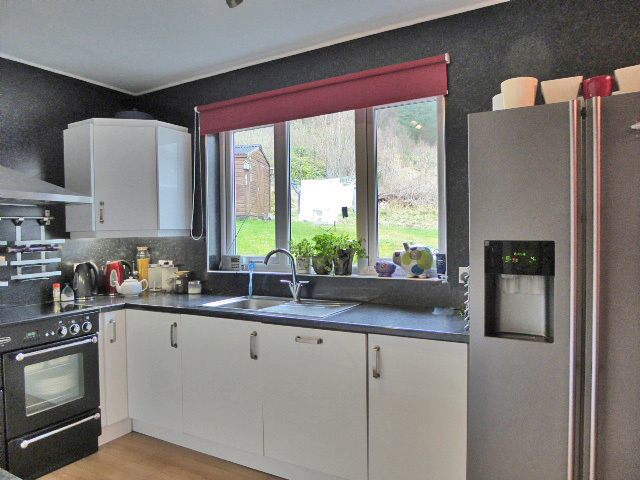 UTILITY 2.45m x 2.24m (8' x 7'04") Adjacent to kitchen with plumbing and space for multiple appliances. French doors lead onto decking area. 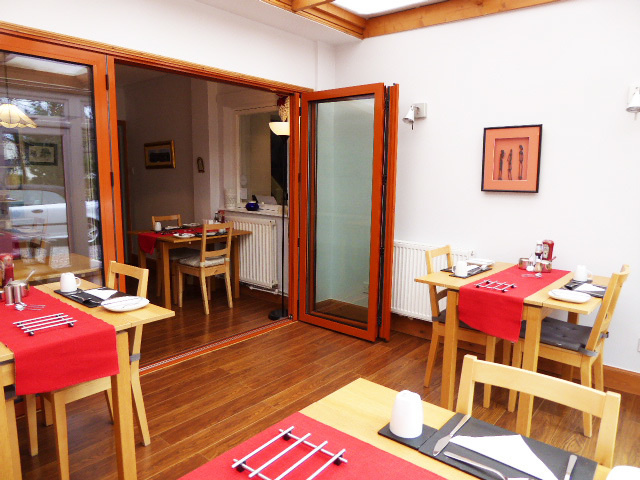 DINING CONSERVATORY 6.89m x 3.59m (22'07" x 11'09") (overall size) An extended rear facing room divided by large bi-folding doors that can be used for dual purpose. A separate sun conservatory and dining room or for those special occasions the bi-folds fully open to form one large dining room. 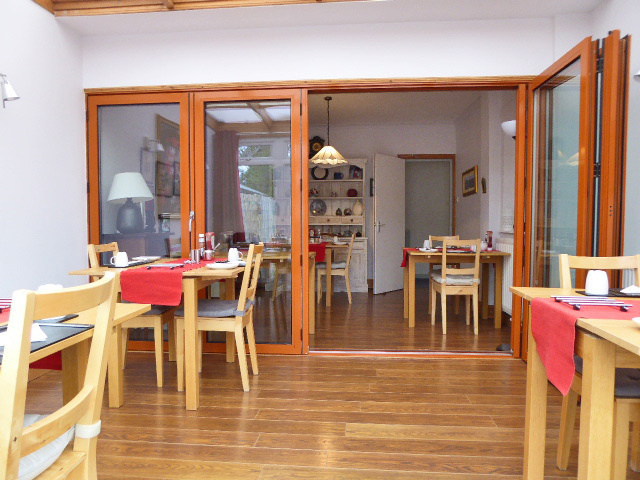 French doors open on to the rear garden grounds. Laminate flooring. 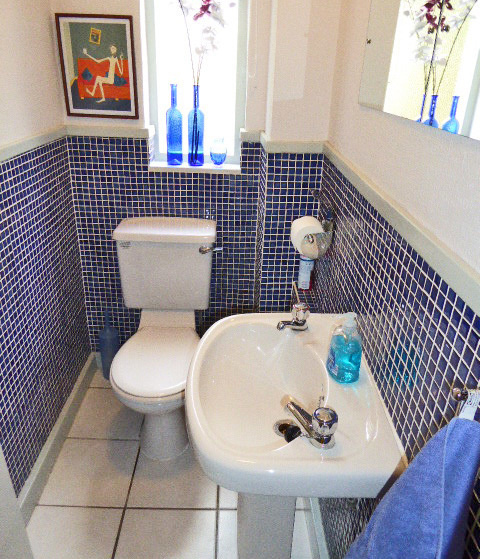 WC, GROUND FLOOR 1.86m x 1.06m (6'01" x 3'05") Mosaic style tiled walls and large modern floor tiles. Extractor, W.C and wash hand basin. BEDROOM 1, GROUND FLOOR 3.46m x 3.06m (11'04" x 10'00") (into recess) Recess with hanging rail and shelf. 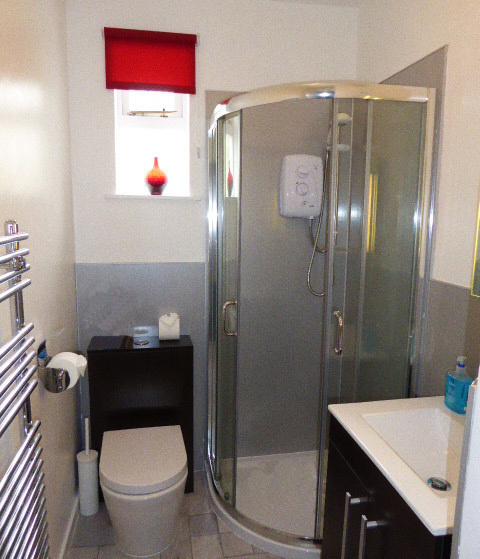 Carpet flooring SHOWER ROOM 1, GROUND FLOOR 2.58m x 1.45m (8'05" x 4'09") Comprising, W.C, wash hand basin with vanity cupboard below, shower cubicle with wet wall finish. Heated towel rail and vinyl flooring. BEDROOM 2 (GROUND FLOOR) 3.08m x 3.08m (10'01" x 10'01") Rear facing with built in wardrobe with hanging rail and shelving. Carpet flooring BEDROOM 2, EN-SUITE 1.47m x 1.45m (4'10" x 4'09") Comprising, W.C, wash hand basin and shower cubicle with wet wall finish, extractor, fitted mirror with lighting over. Vinyl flooring. BEDROOM 3 (GROUND FLOOR) 4.27m x 3.90m (14'00" x 12'09") (longest x widest points) Bright and spacious rear facing room with carpet flooring. Sliding bi-fold door providing access to en-suite. Modern wall radiator. BEDROOM 3 EN-SUITE 2.27m x 1.40m (7'05" x 4'07") Comprising a wash hand basin, W.C and shower cubicle. Part tiled walls and tiled flooring. Extractor, light fitting with shaver socket. FIRST FLOOR Split level stairway with carpet flooring. A fully glazed door with side panels provide access to the balcony and large seating/sun decking area and affords the stairway and landing with plenty of natural daylight. There is a large walk-in store cupboard with additional storage to the eaves. 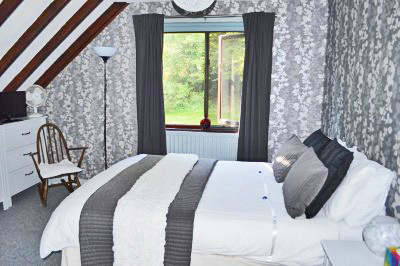 BEDROOM 4 3.63m x 2.85m (11'11" x 9'04") (at longest x widest points) Rear facing enjoying views over the garden grounds. Carpet flooring. BEDROOM 4, EN-SUITE 2.44m x 1.30m (8'00" x 4'03") Comprising, W.C, wash hand basin, shower cubicle with part tiled walls. Heated towel rail, Velux style windows, and vinyl flooring. 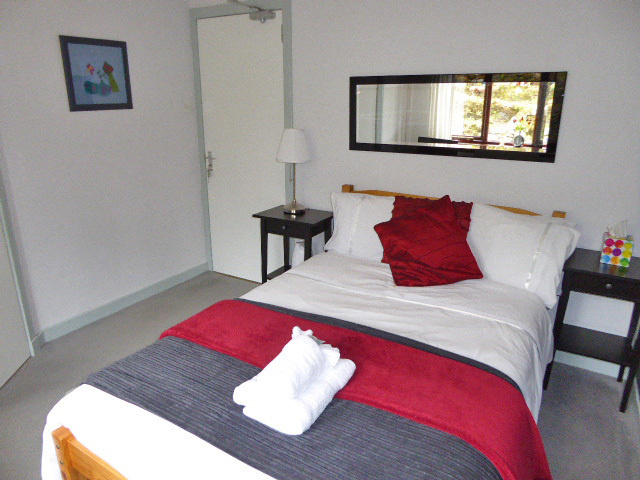 BEDROOM 5 4.26m x 3.85m (13'11" x 12'07") A bright and spacious room providing views over the garden grounds. Carpet flooring. SHOWER ROOM 2.08m x 1.80m (6'10" x 5'11") ( Spacious shower room, comprising, W.C, wash hand basin, shower cubicle, extractor, velux style window, wet wall finish, mirror with built in light, heated towel rail. BEDROOM 6 4.06m x 3.77m (13'03" x 12'04") (at longest x widest points) Front facing room enjoying views over the decking area and mountains beyond. BEDROOM 6, EN-SUITE 2.35m x 1.36m (7'08" x 4'05") (at longest x widest points) Comprising, W.C, wash hand basin, shower cubicle, extractor, wet wall finish, heated towel rail and mirror with built in lighting. 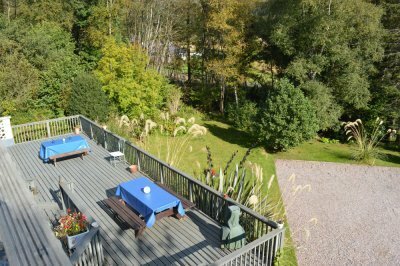 This delightful property sits in approximately ¼ acre of ground in a woodland setting. There is a variety of mature trees, shrubs, grasses and flowers throughout the grounds. A long gravel driveway provides parking for in excess of 6 vehicles. The driveway is to the front and side of the property. The front is relatively open with a low-level wall forming the boundary. It is predominantly gravel for parking with grass and shrubs. 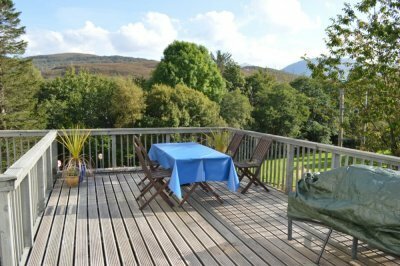 Sun decking area provides plenty of seating and views towards the surrounding hillsides. There is a gravel path to the rear bounded by a rockery retaining the garden grounds. Sloping grass, garden shed, outside tap and lighting.